A 26-YEAR-OLD man from Chivi, Zimbabwe suspected of being mentally challenged, is on the run after he allegedly killed his elderly aunt by striking her on the head with a pestle (grinding tool) after an argument over a plastic bathing dish, police have confirmed. 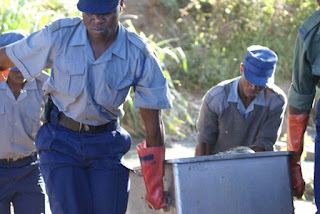 Absalom Muvengwa of Runesu Village under Chief Madzivire struck Shambadzirai Zinhuwe (74) of the same village with a pestle several times on the head leading to her death. Masvingo police spokesperson Chief Inspector Charity Mazula said the incident occurred on Wednesday at around 8am. She said the man fled the scene after committing the crime and police are looking for him. “I can confirm receiving a report of murder involving a man who killed his aunt over a bathing plastic dish,” said Chief Insp Mazula. She said on the day, Zinhuwe was doing household chores with her nephews Thomas Mutamburiro, Brighton Magura and a 17-year-old teenage boy. She said later the teenager took a plastic bathing dish intending to bath but Muvengwa who was also at home stopped the boy from using the dish. Muvengwa, Insp Mazula said, told the boy that he had taken the wrong dish but the boy insisted that he wanted to use the same dish to bath. Chief Insp Mazula said a misunderstanding arose between the two leading to a protracted fight. When the juvenile realised that he was being overpowered, he fled and hid behind a house. She said when Zinhuwe, who was now in the house, heard the noise she went outside to investigate, only to find Muvengwa holding a stone intending to strike the boy. The boy then hid behind his aunt and Muvengwa missed the target and struck Zinhuwe on the head and she fell down. Muvengwa then started chasing after the boy but failed to catch him before turning to Magura and Mutamburiro who also escaped. Muvengwa returned home and found his aunt still lying down while writhing in agony. In a moment of madness and undeterred he took a pestle and struck her several times on the head. Chief Insp Mazula said when the trio returned home they found Zinhuwe lying lifeless in a pool of blood but Muvengwa had already disappeared. The matter was reported at Ngundu Police Base and Zinhuwe’s body was taken to Chivi District Hospital mortuary for post-mortem.